This is my piece for Waterstones Book Club, where I was asked to write about why – and how – I wrote Bad Pharma. The full book club caboodle is here, and you can buy the book here. I totally just walked past a tube advert for my book. You might not find this as weird as I do, but I totally just walked past a tube advert for my book. SO: there’s a lovely new edition of Bad Pharma out this month, with a spanking extra chapter about all the bad things that naughty people like the ABPI and EFPIA have done in campaigning against trials transparency, and all the good things that lovely people like the BMA and EMA have done to advance the cause of patient safety. More to come on all this, but until then: here’s an unnecessary animated gif of me tooling around, via a baffled tourist on the platform. 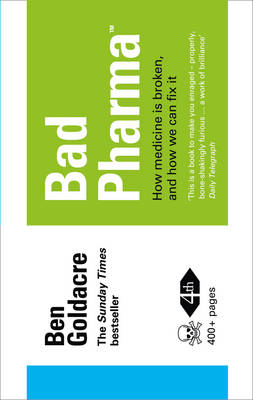 New super cheap edition of Bad Pharma, with extra chapter, and: Waterstones Book Club! RIGHT. Sorry to be absent, I’m back from outer space. NOW. There’s a new cheap edition of Bad Pharma out this month, with a new and very long extra chapter on everything that’s happened since the first edition came out. There are goodies and baddies galore, I’ll be writing about it all over the next few weeks, but if you’re impatient, there’s lots on the AllTrials website already. Before that, Bad Pharma is Waterstones Book Club “Book of the Week“. This means it’s discounted, and out on the tables in Waterstones. More importantly, there’s a podcast discussion, and a book club reading guide. These are often great fun, and it’s worth checking out some of the others: they give suggested discussion points, this one has a piece by me on why I wrote the book, and how medical leaders have failed to address the problem of missing trials. They also asked me to write about how I write, so there’s a splurge at the end about the huge synchronising data monster I’ve built to hoover up and organise knowledge. Your mileage, as they say, may vary. And as always: remember to sign up to www.alltrials.net, our campaign to stop clinical trial results being withheld from doctors, patients and researchers. We cannot make informed decisions about which treatment is best, as long as this information is being casually withheld. History shows that quiet backroom activity has failed to fix the problem: loud, public scrutiny is the only hope we have, and that means you.